Sprint EVO launch tops previous record help by Palm Pre | Android Blast! 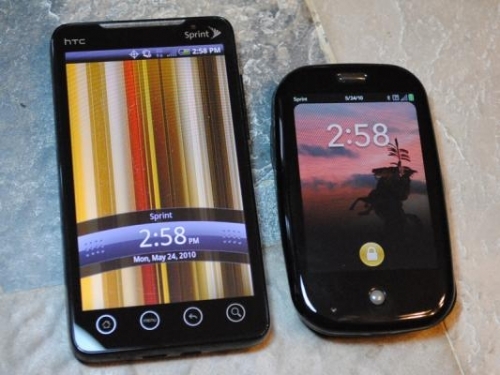 The Sprint EVO launch last Friday beat a record previously held by the Palm Pre. Android Central reports that the EVO launch set the record for single day sales at Sprint. Official numbers are not available, but they are estimating Sprint sold 50,000 EVOs. What does this say about the Palm Pre? There was so much hope for webOS but most of the carriers have moved on to Android, BlackBerry, and the iPhone. Will HP's purchase of Palm mean better phones down the line? Nobody knows. I love the simplicity of webOS, but at some point I'll probably have to give in to the iPhone. I picked up an EVO last Friday and it's a powerful device, but it's very big, very heavy, and Android is not as refined as the iPhone or webOS. That said, the 4G speeds are nice. Will Palm be able to compete at all? Stay tuned.